A wine blended from the Cabernet Franc and Cabernet Sauvignon grapes. The grass growing between the rows of vines was sown a little more than 10 years ago, to create greater concentration of flavour in the grape by limiting the range of the vine. The introduction of differing times of picking for the vendage, takes into account the maturity of both grape varieties, allowing the distinctive elements of the grapes more freedom of expression. After the alcoholic fermentations the malolactic fermentation takes place in stainless steel vats under controlled temeperatures. The blending of the two varieties takes place in the early part of the year. The wine is bottled during the spring to seal in its beautiful aroma. 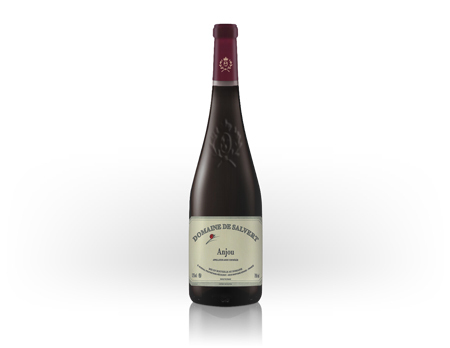 This Domaine wine is a classical "Anjou", a good strength wine with a pleasant bouquet of liberal red fruits. Whilst the wine is young it may have a fairly strong tannin flavour but by the autumn this dissipates and becomes even more harmonious with age. To appreciate its fruity flavour it is best when drunk young and cool (15°C) to appreciate it fruity flavour alternatively you can wait a while and drink it at an ambient temperature to reveal a more developed bouquet. The area of land within the "Villages Appellation" is shown on the local plan under the name of "Les Demoiselles". We have kept this charming name on the labels of this Anjou Rouge made of good vine stock and concentration. The Cabernet Franc grape variety is delightfully expressed in this wine. The terrain "Les Demoiselles" is clay and chalk with good trace elements of schist, the South/South East orientation is ideal. After vinification the wine is delicately transferred to the lower part of the cellars and placed into barrels. The contact with the wood in this case is used to create the micro-oxygenation of the wine. The supplementary tannins brought in are, in our opinion, a secondary consideration. The suppleness displayed by our red wines is one of their characteristics. We do not believe that "hardening" the wine by the addition of tannin, which is often badly balanced, is beneficial! Maturation lasts at least a year. After this time the Anjou Villages is put on the market for tasting and drinking during the next few months, however it can be cheerfully kept in a cellar. The wait can often bring good surprises ! Restaurateurs are not wrong when they see the welcome this wine has on their menus. We would advise you to drink these wines at ambient temperature or lightly chilled (160 to 180) in summer to allow the aromas to escape.